According to the National Retail Federation Mother’s Day in the United States is almost a $24 Billion business. However, most brands miss the mark with their advertising and marketing because they neglect marketing to mothers and focus their efforts on dads. According to BSM Media, the premier Marketing to Moms agency, eighty-six percent of mothers purchase at least one gift for another mom for Mother’s Day. In anticipation of Mother’s Day, BSM Media surveyed over 800 mothers on their giving and receiving behaviors around Mother’s Day. You might be surprised by what they told us. Whether your target market is Millennial Moms or Boomer Grandmothers, these 4 tips are certain to increase your bottom line. Don’t forget moms are buying Mother’s Day gifts too! 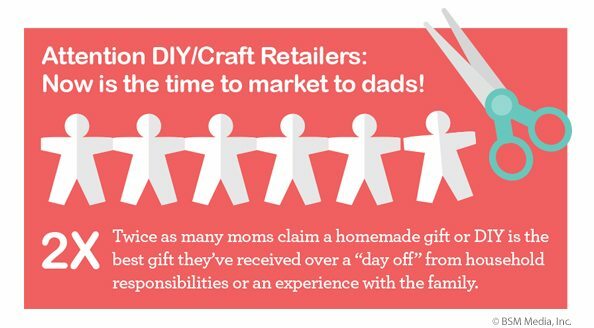 Many marketers focus on marketing to dads as the sole purchaser for Mother’s Day, but research shows that moms are the largest consumers of gifts and cards for this holiday. It’s not too late to refocus your digital content and social media on moms by engaging micro-influencers like mom bloggers or social media moms. Encourage these influential mothers to post photos of your product and suggest it as a great gift moms can buy for besties, extended family, and her own mother. Use Pinterest to get her attention. Not only do millennials love Pinterest for fashion trends and event planning, but they also use this social outlet for creative and original gift ideas. 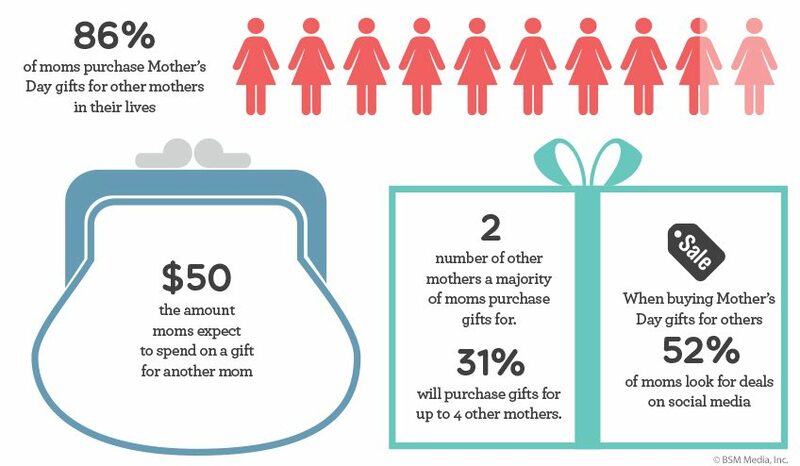 Seventy percent of moms pointed to Pinterest as their go-to resource for gift ideas. To make it even easier for you, we’ve compiled a list of the most commonly searched terms she’s using on Pinterest to find the perfect Mother’s Day gift. Posting branded photos linking to your site is a simple way to put the digital spotlight on your products. Promote new ways to create clever gifts with your product. Mothers love handmade gifts, and todays’ DIY enthusiasts like to turn everyday items into something original and customized. Brands like Nouno’s Greek Yogurt and Duck Tape have reaped the benefits of this by demonstrating new ways to use their products. Recently, BSM Media engaged millennial mom influencers to create original and fun Easter baskets with Mayka Tape and generated over 1 million views of the DIY project driving sales ultimately to Walmart. Millennial moms in particular love to discover new ways to use old products that they love already. Reviews. Reviews. Reviews. These are one of the most important marketing tools for any company. Millennial moms live by reviews. According to “Millennial Moms: 202 Facts Marketers Need to Know to Build Brands and Drive Sales” by Maria Bailey, almost every millennial mom reads a review before purchasing a product. Make sure your brand reviews are authentic and numerous during key buying seasons like Mother’s Day, graduation, and Father’s Day. 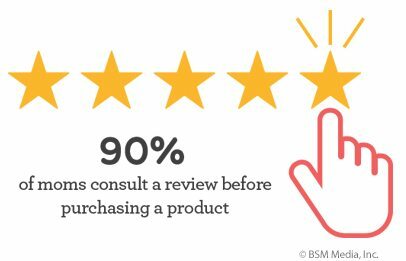 Remind your existing customers to leave a review when they purchase your product online, and always respond to any negative reviews. Mother’s Day is just the start to a very busy gift buying season. Stay on top of your Marketing to Mom insights and influencer marketing opportunities by visiting www.MarketingToMoms.com. To learn how BSM Media can help drive sales for your product, contact Meganbailey@bsmmedia.com.